Check out the latest Lip Monthly News on My Subscription Addiction! Lip Monthly December Holiday Lip Bundle – Available Now! 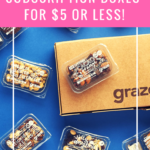 Lip Monthly is Adding Customization + First Box for $5!